I came across this work quite by accident. A marvelous work for oboe that contains something for everyone. An excellent performance and recording. Too good not to share. Under the “are you that stupid or do you think we are” column. sounds like a really bad writing on a B movie mob flic. My favorite story, this week, was reading about middle-class Trump voters finally realizing they got screwed by the GOP tax-reform bill. I’ll enjoy watching Republican farmers go bankrupt, also, because I’m not a good person, and they were warned. Guess who buys those farms for pennies on the dollar when those “salt of the earth” red-blooded patriots have to sell to salvage anything they can? Big-Ag business! I might be missing the point of the Sunday thread. Sorry. How true. Farmers and rural communities just love to vote republican even though republican policies are directly counter to the best interests of these communities. They vote republican and then run to the last democrat left standing to repair the damage. Most always it is too little too late. They wait four years then rinse and repeat. Yeah, we Americans really need to get over the notion that willful-ignorance is charming and excusable. Not holding my breath. Meanwhile, Chinese 6 year-olds are studying Calculus, and Russian ones are learning how to hack networks designed by Ivy-League grads. jace, thanks. lovely. wasn’t it used recently for background music in a movie? a languid foreign film maybe? … most of his operas are comedies. He also wrote instrumental works and church music. Cimarosa was principally based in Naples, but spent some of his career in various other parts of Italy, composing for the opera houses of Rome, Venice, Florence and elsewhere. He was engaged by the empress of Russia Catherine the Great as her court composer and conductor between 1787 and 1791. In his later years, returning to Naples, he backed the losing side in the struggle to overthrow the monarchy there, and was imprisoned and then exiled. He died in Venice at the age of 51. 4 years with Catherine, no wonder he wanted to over throw monarchies. I think Cimarosa’s music is very much under appreciated. It is fun to be able to share his work with others. Thanks for the background information. happy birthday to the 25th! at 52 years old, lest we forget you exist and are there for us in our time of need – like now. 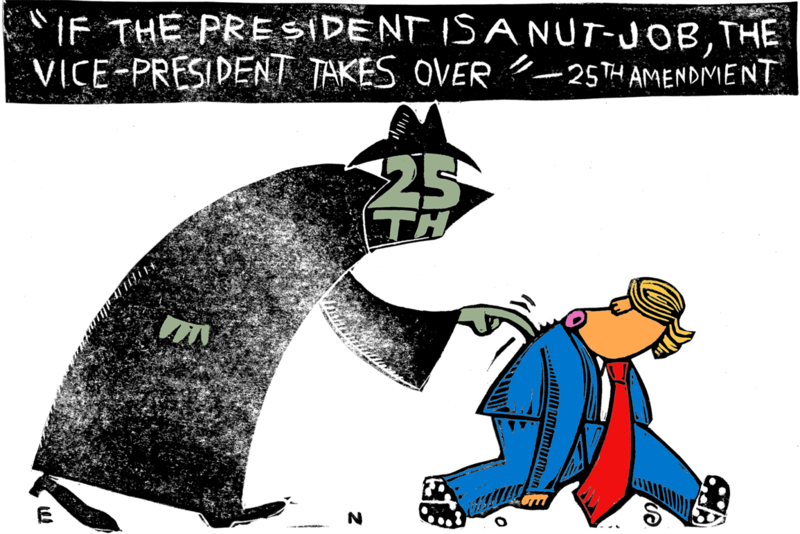 wiki: The Twenty-fifth Amendment (Amendment XXV) to the United States Constitution deals with issues related to presidential succession and disability. It clarifies that the Vice President becomes President (as opposed to Acting President) if the president dies, resigns, or is removed from office; and establishes procedures for filling a vacancy in the office of the vice president and for responding to presidential disabilities.The Twenty-fifth Amendment was submitted to the states on July 6, 1965, by the 89th Congress and was adopted on February 10, 1967. Sitting alone watching Fox News and imagining caravan hordes that don’t exist. I think that it is time to invoke the twenty fifth amendment. It would be silly to wait until he decides to nuke Guatemala. 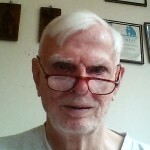 Jack – not that I have not thought of doing something like that. The marina owner might object though. kgc, yikes is an understatement when the realization hits that millions of voters were exposed to, glanced at and even read them out of line-wait boredom. likely more folks were subliminally influenced by those cover pictures and headlines than by all the campaign ads playing incessantly on TV and radio. … it’s clear that Pecker’s assistance to Trump did not end with the catch-and-kill, or even with the outlandish Cruz story. 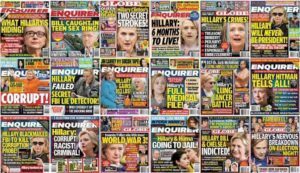 As Quartz’s Heather Timmons documented a few months ago, the National Enquirer and its sister publication the Globe ran 35 covers with anti–Hillary Clinton stories. It’s worth considering whether these stories helped decide the outcome of the election. There are 37,000 supermarkets in America, with an average of about 10 checkout stands each, and many stands feature a wire rack displaying the Enquirer, the Globe, often the company’s other tab, the National Examiner, and celebrity magazines. According to an industry study, American households make an average of 1.5 trips to the supermarket each week. 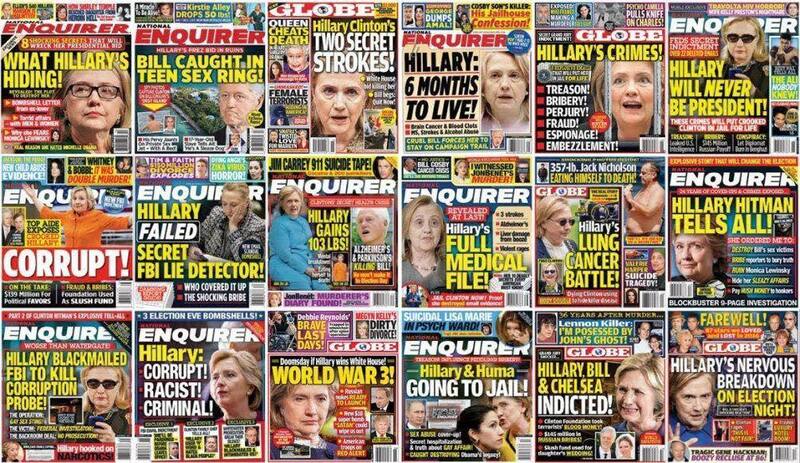 Of course, one might retort that while lots of people see the Enquirer, they also know that it’s, well, a supermarket tabloid, and everyone knows it’s false—the original fake news, long before the internet or Russian trolls. But Jamieson notes that studies show that sustained exposure to even information people consciously recognize as bogus can have an effect. Beyond that, many of the stories in the National Enquirer echoed, or inspired, conspiracy theories that circulated online, creating even more familiarity and exposure. Jamieson says the fade of tabloids might have actually made them more likely to penetrate. Many supermarkets have slimmed down their tabloid offerings in favor of more legitimate magazines, from O, The Oprah Magazine to Good Housekeeping. And Clinton played into AMI’s hands. The tabloids had been saying for months that Clinton’s health was failing. Then, on September 11, 2016, she appeared to faint at a 9/11 commemoration ceremony. It turned out that she was suffering from pneumonia. The episode, and the appearance that the campaign had tried to cover up her illness, gave the National Enquirer rumors an aura of accuracy. Lovely music (again) Jace. For those troubled by digital clicks, here’s an alternative URL with a new digitization. Amy is in.This is getting interesting. Is there anyone from the senate who is not running? I thought Warren was quite good yesterday, the best so far. 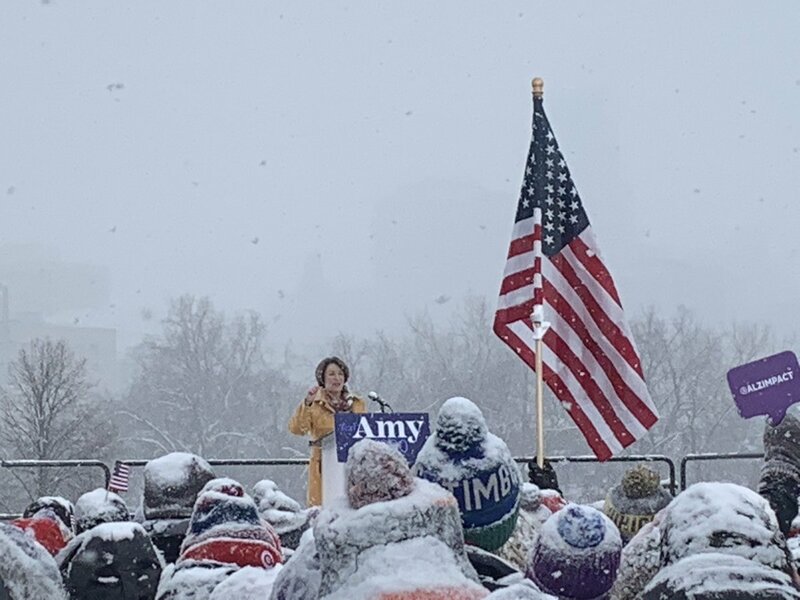 Klobuchar is going to rule from her “heart?” Nonsense. 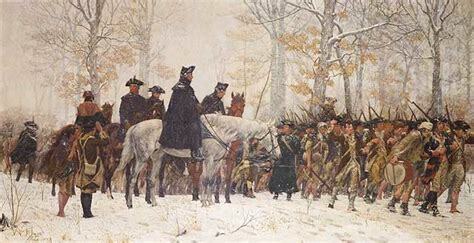 Or, if she’s serious, she made a lousy start by keeping her Army waiting out in that crappy weather while she was inside next to her space heater. I won’t vote for that kind of leader. Amy in the snow. Like that other Minnesota snowlady, Lindsey Vonn. Two tough gals. Amy’ll need ‘tough’. Before she even announced the rippers were already doing a hatchet job on her. The word they’ve decided to run with is, CRUEL. Mr Flatus, it was above zeroF, so that army didn’t suffer a bit. If it had been -30F, then the conditions would have been a little harsh. xrep, I was rather amazed at the size of her crowd, As I understand it she is the most popular senator running in their home state. The people who know her best like her best. xr, y’all must understand that I’m a southerner and those temperatures were lower than we shall see this decade. My comment was based on our perceptions down here. I’ve been above the 38th in Korea with no canvas on my vehicle; that’s cold. I’ve watched the soldiers run convoys across the Missouri in the dead of winter down in Jack’s country that’s cold. And I’ve been on the flight-line when tail-gunners were carried out of their work spaces at the end of their missions from Guam to Hanoi and back. That’s exhausted and cold. And Guam is down south. Well, I’m from down south but I’ve been exposed to cold – nothing like Flatus’ context however. Last week we saw -4. It was cold. Of course 6 years in NH took the edge off my hot&humid tolerance and gave me a bit of cold tolerance. Of course in MN it comes and stays a while unlike here where it comes, hangs for a couple days then heads out to the NE. We don’t normally have outdoor political rallies during those cold days. Then again we ain’t MN. I don’t know how ‘moderate’ Klobuchar is. 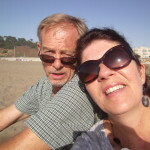 She is a Democrat and stands for equal rights and opportunities, clean air, soil, and water, science, public education, the rule of law, the graduated income tax, NATO, Roe v Wade, the celebration of our diversity, and background checks. republicans would call her a dangerous leftist. You campaign in New Hampshire through the snow and cold and it can be a miserable slog. 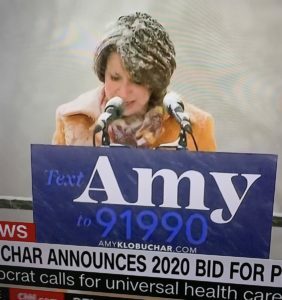 Amy may be well suited to their abominable weather. 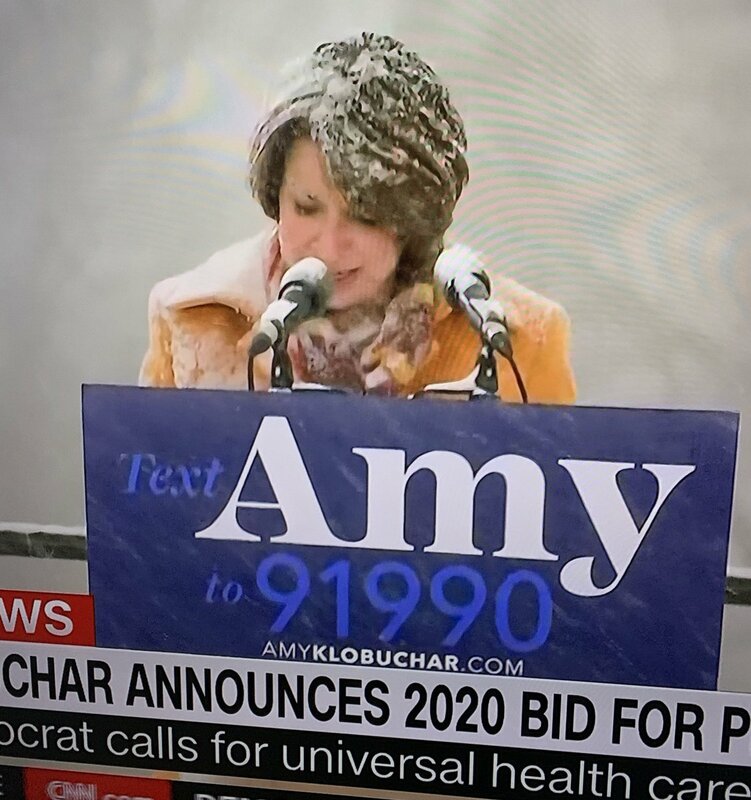 I think Klobuchar is working IA and WI, as they’re close to home. Unless she’s found in bed with a live republican or a dead woman she should already have Minnesota in the bag. 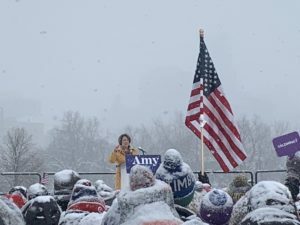 WI was ignored by the Dem candidates in ’16, and Amy might be able to campaign alone there, while others struggle for slices of the earlier, closer, and larger prizes. It’s going to be a wonderful year for the popcorn farmers. We’ve made friends with one, and hope to ensure that we at least won’t run out. flatus, that must have been a weather report put out by the Russian bots. nbc reported 15 above so amy ‘s army wasn’t made to stand in 4 below. 15 is quite balmy considering what we’ve been seeing of late. Monday morning, just like every morning is asking if SFB and the weird guy are in jail. And always being disappointed. Not a great way to start the day. 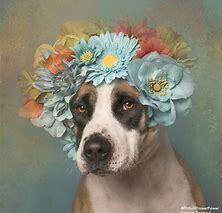 Well, g’morning. I see that 3 anonymous (aka chickenshit) ex staffers are saying Amy is a bad boss, Personally, I look forward to the possibility that we might have a president who works hard and expects her staff to do the same. 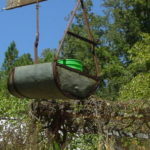 BB, get your shore power situation straightened out? I don’t know anyone who likes being cold on a boat.